ASTANA -- The recent meeting of Central Asian leaders in Astana is a game changer in the political and economic future of the region and a step towards close co-operation among the former Soviet states without the influence of Russia. Presidents Nursultan Nazarbayev of Kazakhstan, Sooronbai Jeenbekov of Kyrgyzstan, Emomali Rahmon of Tajikistan and Shavkat Mirziyoyev of Uzbekistan sat at a single table in Kazakhstan's capital Thursday (March 15) to discuss regional co-operation. It marked the first time in nine years that their countries' leaders had gathered for talks. The chairwoman of the Turkmen parliament, Akja Nurberdiyeva, also participated in what the countries billed as a "working meeting" rather than a summit. "We must solve all problems ourselves and ensure prosperity for the people," Nazarbayev said at the meeting. Mars Sariyev, a political scientist from Bishkek, emphasised the importance of a Central Asian leaders' conference without Russian participation for the first time. "The co-ordination of Central Asian countries is reaching a new level," he told Caravanserai. "Until now, the states in our region were the [pawns] of external players," he said. "Now the Central Asian countries have started to play their own game... without a manager on the sidelines." Holding the meeting on the eve of Nawruz symbolises the countries' search for ways to create a dialogue on regional problems after years of tension, say observers. "It is very symbolic that on the eve of [Nawruz] we express our desire for regional cooperation, mutual support, and joint solution of topical issues in order to ensure the security, stability and sustainable development of our entire region," according to a joint English-language statement by the leaders posted on the Kazakhstani prime minister's website. Uzbekistan sparked the warming relations with a policy shift after years of bellicosity from its long-time leader, Islam Karimov. He died in September 2016. His successor, Mirziyoyev, broke precedent by making his first official visits within Central Asia, including Kazakhstan, immediately after being sworn in. By doing so, he defied predictions he would go to Russia first. 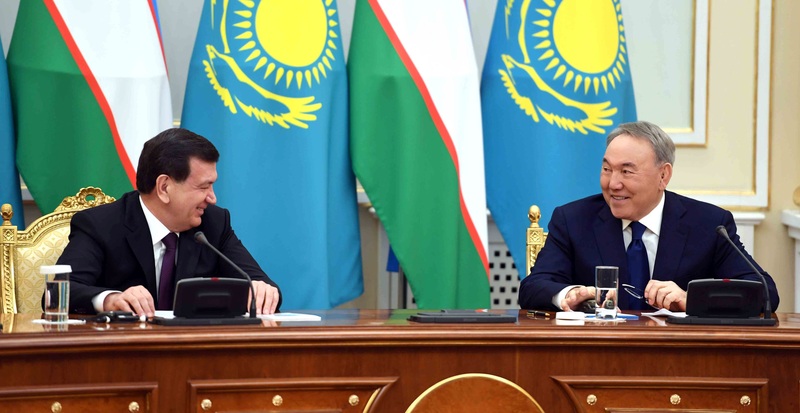 Nazarbayev, at the conference, credited Mirziyoyev with taking the initiative to create a regional forum. Topics in Astana included regional security, the situation in Afghanistan, trade and economic co-operation, cross-border transportation agreements and the importance of strengthening cultural and humanitarian ties, Nazarbayev said at a news conference. Kazakhstan proposed mechanisms for regular five-sided consultations to work out co-ordinated positions on Afghanistan and to advance these joint positions in international forums. "Most importantly, we have a common understanding and desire to build up our partnership and meet each other halfway," Nazarbayev told journalists after the meeting, according to his official website. "Therefore, we agreed to hold such meetings regularly on the eve of the great Nawruz holiday." Cross-border water sharing, another pressing issue and the cause of many years of conflict between Uzbekistan and its neighbours, will also be solved together from now on, he added, according to the statement. Citizens of the region are welcoming the co-operation. "I've been frequently reading opinion pieces about how Central Asia was 'sitting' on a powder keg because of serious unresolved problems, the main one of which was cross-border water sharing," Saken Razdykov, a 52-year-old resident of Almaty, told Caravanserai. "Thank God, common sense prevailed and our countries have started to co-operate," he said. In the past, Central Asian countries have attempted to attract investment on their own, but they have not had particular success, said Kasymkhan Kapparov, director of the Kazakhstani National Bureau for Economic Research in Almaty. "One of the goals of such meetings is to look at the possibilities for joint investments," he told Caravanserai. One of Nazarbayev's priorities has been the development of regional trade. The growth of mutual trade contributed to raising the standard of living among Central Asians, Nazarbayev told journalists at the conference, adding that "many opportunities" exist to expand trade in the region. It is necessary to solve the problem of finding Central Asian sources of funding for more trade, he said. "This should have happened long ago," Olga Karelian, a 42-year-old entrepreneur from Astana, told Caravanserai. "During those [lost] years, our countries ... could have become more developed and the standard of living could have risen." "It's a shame that we lost a lot of time," she said. "But better late than never."